The dhuni is a sadhu's sacred fire, passed down through the ancient lineage of yogis from Guru Dattatreya himself. It is the center of their universe. The yogi lives, meditates, studies, sleeps and teaches in the light and smoke of the dhuni. This Cyber Dhuni is an online gathering for disciples in the lineage of Yogiraj Handiya Baba and Swami Vishnudevananda Saraswati of Prayag to share the teaching of the dharma through original writings, poetry, translations of sacred texts, and recordings of discourses. The Hindu tradition is vast and multifaceted and we understand that our perspective is just that—our perspective; but sitting at this dhuni we are trying to faithfully share the voice of tradition, the revelations of the scriptures and the teachings of our gurus. We are in the tradition of the Juna Akara, an ancient order of naked yogis, babas, sadhus and shamans. 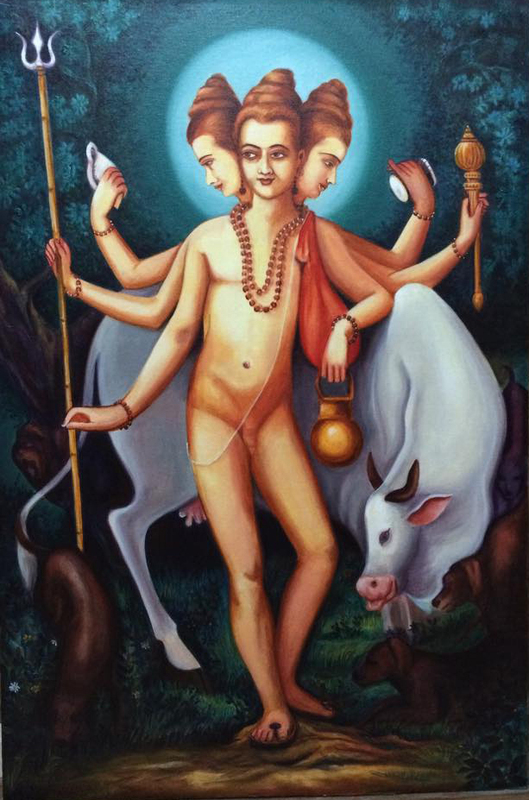 Our lineage is traced back to the primordial yogi, Dattatreya. The divine son of Atri Rishi and Devi Anusuya, Dattatreya was an avadhuta, one completely unfettered by social, religious or mental conditioning, immersed spontaneously in the Self. Like the Truth itself, he remaines always naked or digambara (sky-clad), for nothing can cover His liberated consciousness. He is often depicted with three heads, as he incarnates and transends the triune-godhead Brahma, Vishnu and Shiva. He is surrounded by four dogs, representing the Vedas and by Surabhi, Mother Earth as the divine wish-fulfilling cow. As Dasnami Sannyasis (members of the ten-named monastic order) we are also descended from Shankaracharya, an incarnation of Lord Shiva born in 509AD in a Nambudiri brahmin family in Kaladi, Kerala. He left home the age of eight and studied with his guru Govindapada for 8 years, during which time he wrote his famous non-dualistic commentaries on the Bhagavad-Gita, the ten principal Upanishads and the Brahma-Sutras. These three are bacame the textual foundation for his school of Advaita Vedanta. From the age of sixteen he traveled throughout India, teaching Vedic wisdom, writing poetic works of devotion, and esoteric treaties on Yogic and Tantric practice, establishing temples, and reorganizing the earlier Shiva ascetic lineages. Shankaracharya left his body in the Himalayan shrine of Kedarnath at the age of thirty-two. Swami Hridayananda Saraswati (1850-1954) was an great saint of Allahabad, who used his expertise in yoga to help thousands regain their health and spiritualize their lives. H.H. Swami Vishnudevananda Saraswati (1904-1997) was an illumined yogi and saint residing at the Triveni Sangam in Allahabad. Guruji would visit the West yearly and wrote many books sharing his simple and profound teachings and realizations with thousands of aspirants. Most Rev. Swami Omanananda Saraswati is the spiritual successor of H.H. Swami Vishnudevananda Saraswati and is the abbot of the Yoga Vedanta Kutir in Allahabad where he serves poor children and guides devotees in spiritual life. Rev. 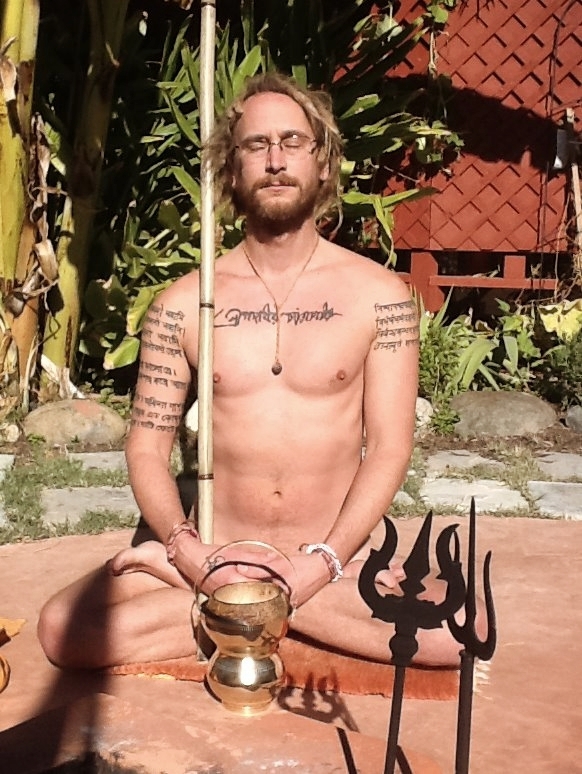 Swami Bhajanananda Saraswati, DMin is a sannyasi (monk), pujari (priest),writer, and teacher living and serving at Kali Mandir Ramakrishna Ashram in Laguna Beach. Rev. Swami Ambikananda Saraswati is a sannyasi (monk), pujari (priest), writer, and teacher living at Kali Mandir Ramakrishna Ashram in Laguna Beach.